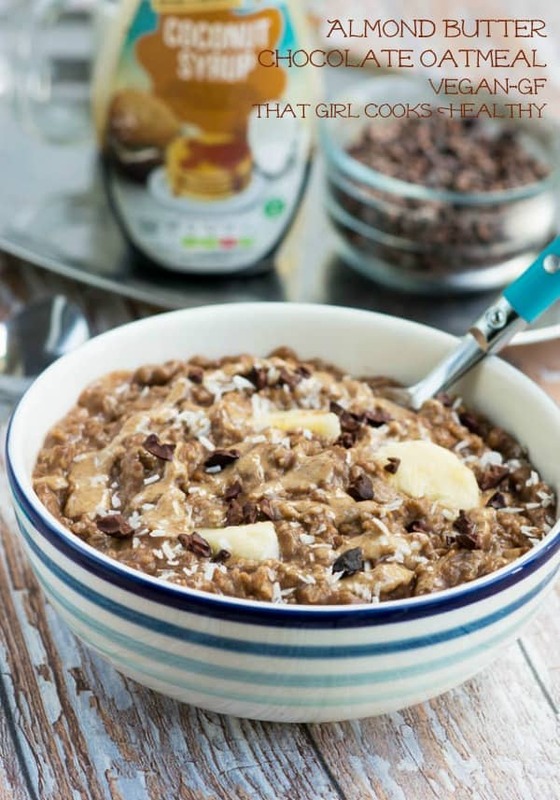 Almond butter chocolate oatmeal – tired of boring dairy free oatmeal? Why not turn things up a notch with some cacao, almond butter and coconut milk. Lately I’ve been thinking about chocolate and that’s really unlike me, I don’t know why but I can’t stop thinking about it. I probably sound like a creepy weirdo, being transfixed with chocolate? Anyway, since I wouldn’t shake off this thought of something rich, sweet and decadent I went ahead with making this almond butter chocolate oatmeal recipe. Initially this might sound horrid or not your thing and I totally appreciate that BUT…..I promise you will love this recipe. This one is for my TRUE chocolate fans, if you’re a choccie fan like moi then you’ve in the right place, at the right time, don’t by pass this one. 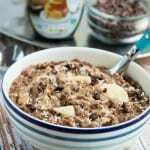 This almond butter chocolate oatmeal recipe gives you the licence to mix your oatmeal porridge with chocolate. How cool is that? Who would have thought the two could combine so greatly together? 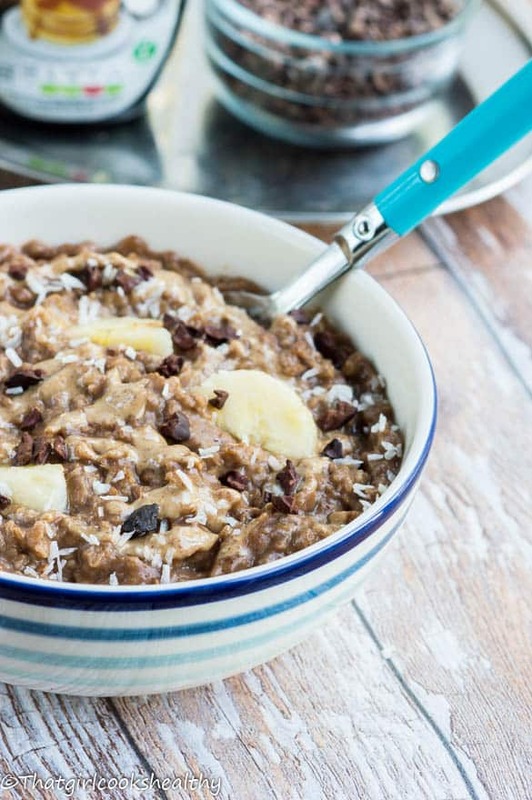 Actually, there seems to be a trend right now or maybe I’m just late on the band wagon with health enthusiasts creating various chocolate oatmeal recipes. From what I’ve seen most contain dairy (Nutella *cough* *cough*). Consequently, being dairy free means having to be one step ahead of the game and that’s what I aim to do for my gluten/dairy free readers, adding some organic raw cacao in place of dairy filled chocolate spread. Although cacao is free from dairy and seemingly bitter in taste due to it’s unadulterated extraction, it requires a meticulous hand in order to reap the true benefits without resulting in a overpowering element of sheer bitterness. I can attest to this first hand, it’s no joke when you inadvertently add an excessive amount of cacao to your recipe, it can be disastrous to the point of being irreversible, plus this good stuff isn’t cheap, rather the contrary. Breakfast just got 10 times better with this award winning oatmeal. Mom, dad your kiddies will love you for adding a generous amount of antioxidant enriched cacao to their mundane oatmeal. The oats are of course gluten free and bulk up with coconut milk, now if you’re not a fan of coconut milk, no worries, simply use a nut milk of your choice. Use plant based milk to yield creaminess – No additional water is added rather the nut milk provides an out-of-this-world type of creaminess. 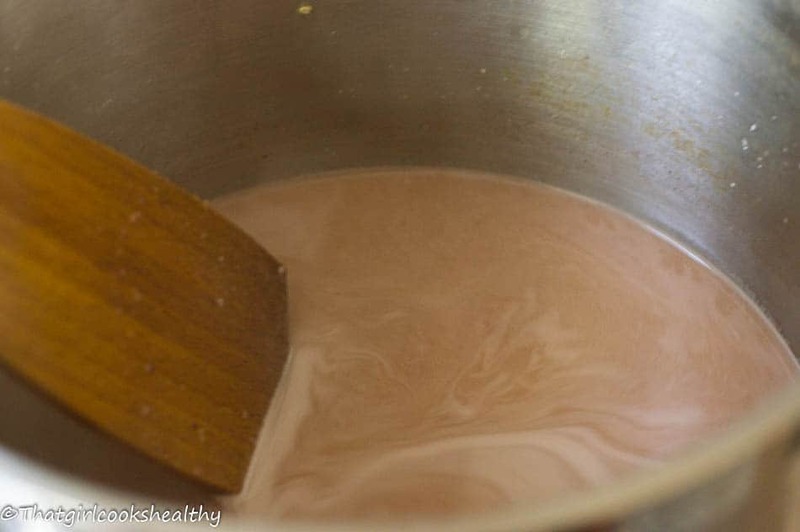 Stir the oatmeal into the chocolate slowly – very important tip to avoid the texture turning lumpy. 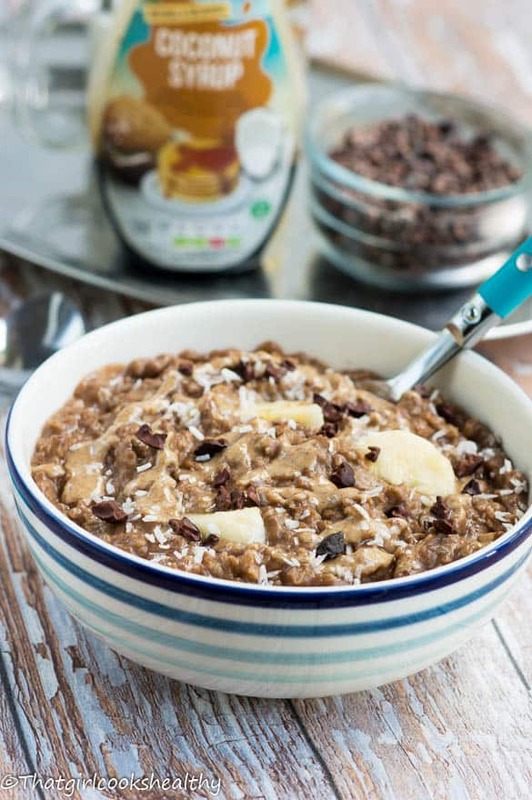 Once the chocolate oatmeal is cooked, simple drizzle some spreadable almond butter out the top and garnish with nuts, seeds, dairy free nibs, heck even fruit – just go all out with this one. It’s healthy, filling, dairy free and child friendly…….Still not convinced? I dare you to try it! First combine the coconut milk, cacao, coconut oil, coconut nectar and vanilla in a medium sized saucepan on medium heat and stir until it starts to boil and steam. Remove the pan from the stove and carefully pour the oats in increments until all is in the saucepan. Be make sure to stir at the same time to lessen the likeihood of lumps forming. Return to the stove, still on medium heat and stir until it starts to thicken to your desired texture. Feel free to add more nut milk if required. Serve accordingly and drizzle with almond butter and garnish to banana, shredded coconut and cacao nibs. I certainly wouldn’t mind starting my day with a big ol’ bowl of this beauty! Chocolate + almond butter = get in my belly! Thanks Sarah, this is my go to recipe right now, it’s so filling. Oh gosh. I need to go eat something. After looking at these pictures my tummy is rumbling. LOL funny, give it a try Whitney. And you are back with another lovely recipe! Your comment certainly made me smile. Yes I try my best to share with others my favourite healthy meals including this one. Thank you SO much, you gotta try it Kathryn. I accept your dare! Although when you start the day with chocolate and coconut milk, it means things can only go downhill from there. I mean, how could it get any better?? I have taken the liberty of nominating you for the Dragon’s Loyalty Award. Do take a while to visit my post on it. Thank you SO much I really appreciate it ;). Yes!!! You must have been receiving some of the chocolate cravings I have been channeling lately, because this recipe has arrived with impeccable timing lol! I’m totally doing this for breakfast tomorrow, it looks amazing. Can’t wait! Hey Jolie, thanks for commenting, I love hearing from you. The chocolate craving is still here. I had some of the oatmeal this morning, I do hope it meets your approval.